Definition at line 25 of file CInternalSolver.h. Definition at line 12 of file CInternalSolver.cpp. Definition at line 19 of file CInternalSolver.cpp. Definition at line 53 of file dintdy.cpp. References c__0, c__1, c__2, c__30, c__51, c__52, c__60, c_b34, C_INT, d_sign(), dls001_1, if(), mxerrwd, and pow_di. Referenced by drchek_(), CLSODA::operator()(), and CLSODAR::operator()(). Definition at line 47 of file dprja.cpp. References c__0, C_INT, dbnorm_(), dfnorm_(), dgbfa_, dgefa_, dls001_1, dlsa01_2, dmnorm_(), max, and min. Referenced by CLSODA::CLSODA(), and CLSODAR::CLSODAR(). Definition at line 46 of file drcheck.cpp. References c__0, c__1, C_INT, d_sign(), dcopy_(), dintdy_(), dls001_1, dlsr01_1, droots_(), max, and switch(). Definition at line 343 of file drcheck.cpp. References c__1, c_b3, C_INT, d_sign(), dcopy_(), and dlsr01_2. Definition at line 43 of file dsolsy.cpp. References c__0, C_INT, dgbsl_, dgesl_, and dls001_1. Definition at line 45 of file dstoda.cpp. References c__1, c__2, C_INT, dcfode_(), dls001_3, dlsa01_1, dmnorm_(), max, min, and pow_dd. Referenced by CLSODA::operator()(), and CLSODAR::operator()(). Definition at line 27 of file CInternalSolver.cpp. Definition at line 39 of file CInternalSolver.cpp. 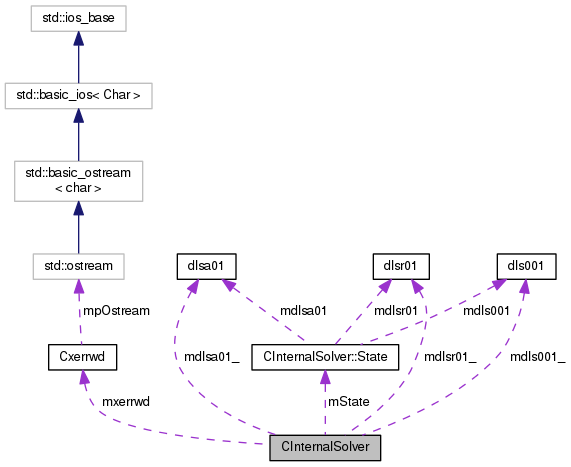 References CInternalSolver::State::mdls001, mdls001_, CInternalSolver::State::mdlsa01, mdlsa01_, CInternalSolver::State::mdlsr01, mdlsr01_, and mState. Definition at line 32 of file CInternalSolver.cpp. Definition at line 22 of file CInternalSolver.cpp. Referenced by CLayoutEngine::CLayoutEngine(), CHybridMethodLSODA::integrateDeterministicPart(), CTSSAMethod::integrationMethodStart(), CLyapWolfMethod::start(), and CLsodaMethod::start(). Definition at line 74 of file CInternalSolver.h. Referenced by resetState(), and saveState(). Definition at line 75 of file CInternalSolver.h. Definition at line 76 of file CInternalSolver.h. Definition at line 77 of file CInternalSolver.h. Definition at line 73 of file CInternalSolver.h. Referenced by dintdy_(), enablePrint(), CLSODAR::operator()(), CLSODA::operator()(), and setOstream().